Extremely scarce pocket map of the United States. 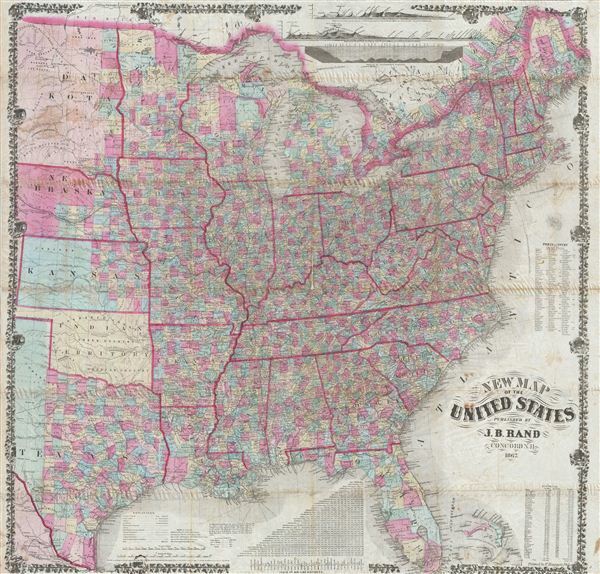 An extremely 1867 rare pocket map of the United States issued in 1868 by J. B. Rand. Issued shortly following the close of the American Civil War, this large map covers the most inhabited parts of the United States from Texas, Kansas, Nebraska and Dakota eastward to the Atlantic. Rand offers a wealth of cartographic detail including counties defined by color coding, railroad lines, tows, cities, elevation shown in hachure, and notations regarding various American Indian nations. At the top of the map there are three elevation profiles including, from top, Lieutenant A. W. Whipple's proposed route for the Pacific Rail Road, a profile view of the United States at 42 degrees north, and a profile of the telegraphic plateau. Other charts scattered around the map offer information on population, mileage, wars, ports, and the wonder of the Mississippi River. Surrounded by an oak leaf and acorn motif border. This map is extremely scarce. We have been unable to identify any other examples in either private or institutional collections. J. B. Rand (fl. c. 1840 - 1880) was a Concord New Hampshire based, justice, notary, inventor, and part time map publisher. Little is known of Rand and his work. Very good condition. Some wear and discoloration on original fold lines. Removed from original binder and professionally flattened. A few minor verso repairs and reinforcements on original fold lines. Comes with original binder.